You are here: Home / Blog / Latest News / Fab Friday & Super Saturday - April Deals! Friday April 5th and Saturday April 6th are the dates of our next special weekend. We’ll have our usual great range of special offers on products, treatments, and therapies. There’ll also be free consultations and expert advice on some of our newer products. 2 for 1 – Allergy Test & Nutritional Consultation for €50! Call (053) 923 6009 to book. Facials – Only €10 with Josephine. Call (053) 923 6009 to book. Reiki Healing Session with Bernie – €25 for 40mins. Call (053) 923 6009 to book. IET Angel Healing Session with Bernie – €25 for 40mins. Call (053) 923 6009 to book. Evening Primrose Oil – Buy One Get One FREE! Healthy Food Tasting and Recipes! Matt’s Omega 3’s – Buy One & Get 2nd Half Price! Natures Aid Sage Leaf – Buy One & Get 2nd Half Price! Through Numerology Soul Readings with Grainne – €25 for 40mins. Call (053) 923 6009 to book. Back, Shoulders & Neck with Janet – €25 for 40mins. Call (053) 923 6009 to book. FREE Eye Health Test with Anne. Call (053) 923 6009 to book. Heart Check with Jenny – Only €20. Save €10! Call (053) 923 6009 to book. Tarot Readings with Marie – €25 for 40mins. Call (053) 923 6009 to book. Rolfing Therapy with Mary – A way to Align the Body & Relieve Pain! €25 for 40mins. Call (053) 923 6009 to book. Ear Candilng Only €15 – Save €15! Call (053) 923 6009 to book. 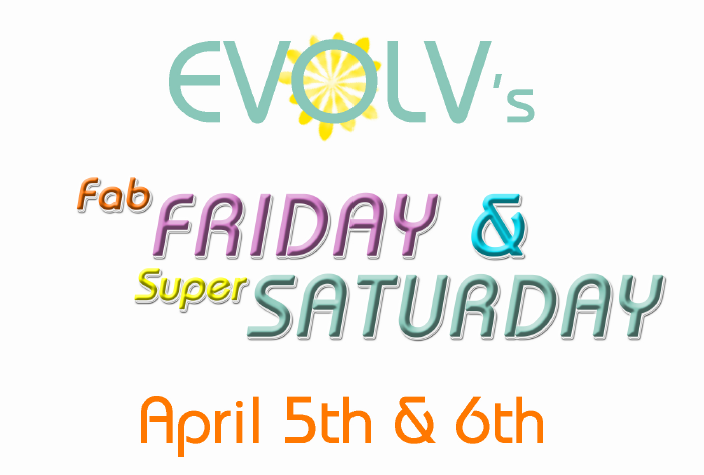 You can see we’ve lots on offer on Fab Friday April 5th and Super Saturday April 6th – so don’t miss out. We look forward to seeing you! Booking is essential. Call us on (053) 923 6009 to book!